Lookie! Day 11 of the Hootenanny is HERE! GRACIOUS ME, my partridges in a pear tree! Here we are on Day 11 already! Have you been having the bestest of times EVER? Are you jamming to the songs? 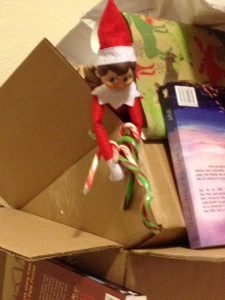 Dancing around the room with the elves in spirit? Hanging out with the reindeer? We hope so, because that’s what this is all about. Fellowship and fun. This place is a total wreck. Every year, we try not to get too uptight about it, but seriously. We can’t find the books with all the tinsel everywhere and the elves strung a bunch of lights all over the reindeer’s antlers, which caused all manner of crazy in the living room. We’ve taken to spiking our own egg nog with things stronger than peppermint, but we’re pretty sure the elves are on to that because the bottle is suspiciously low. Good thing the elves metabolize pretty quickly.